I'd like to tell you a curious story. Jane was a 52 year old woman in need of a kidney transplant. Thankfully she had three loving sons who were all very happy to give her one of theirs. So Jane's doctors performed tests to find out which of the three boys would be the best match, but the results surprised everyone. In the words of Jeremy Kyle, the DNA test showed that Jane was not the mother of two of the boys... Hang on, said Jane, child birth is not something you easily forget. They're definitely mine. And she was right. It turns out Jane was a chimera. Chimerism is the existence of two genetically different cell lines in one organism. This can arise for a number of reasons- it can be iatrogenic, like when someone has an organ transplant, or it can be naturally occurring. In Jane's case, it began in her mum's womb, with two eggs that had been fertilised by different sperm creating two embryos. Ordinarily, they would develop into two non-identical twins. 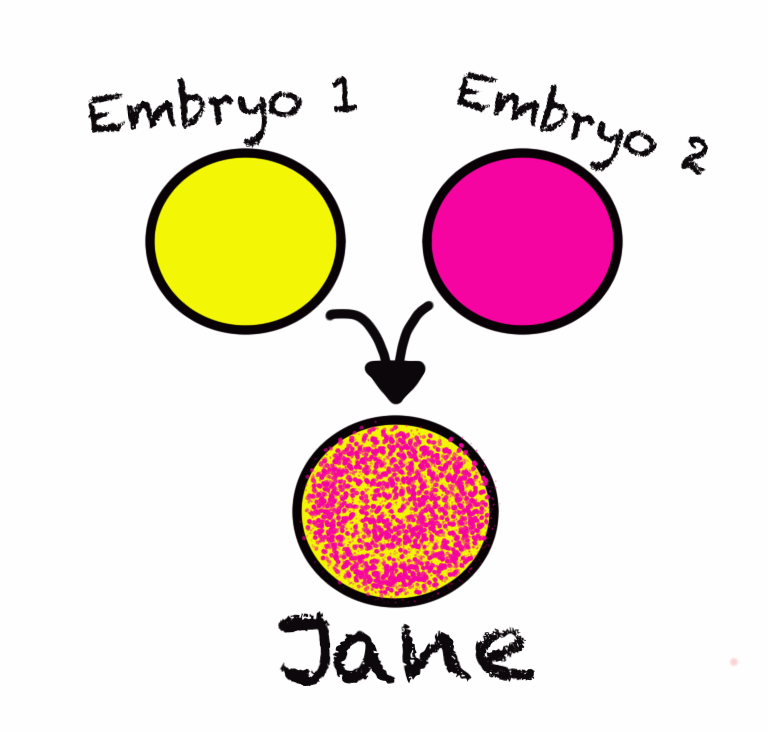 However in Jane's case the two balls of cells fused early in development creating one person with both cell lines. Thus when doctors did the first tissue typing tests on Jane, just by chance they had only sampled the 'yellow' cell line which was responsible for one of her sons. When they went back again they found the 'pink' cell line which had given rise to the other two boys. This particular type of human chimerism is thought to be pretty rare- there are only 30 case reports in the literature. (Though remarkably both House and CSI's Gil Grissom have encountered cases.) What happens far more frequently is fetal microchimerism- which occurs in pregnant women when cells cross the placenta from baby to mum. This is awesome because we used to think the placenta was this barrier which prevented any cells crossing over. Now we've found both cells and free floating DNA cross the placenta, and that the cells can hang around for decades after the baby was born. Why? As is often the case in medicine we're not sure but one theory is that the fetal cells might have healing properties for mum. In pregnant mice who've had a heart attack, fetal cells can travel to the mum's heart where the develop into new heart muscle to repair the damage. Whilst we're still in the early stages of understanding why this happens, we already have a practical application. In the United States today, a pregnant woman can have a blood test which isn't looking for abnormalities in her DNA but in that of her fetus. The DNA test isn't conclusive enough to be used to diagnose genetic conditions, but it is a good screening test for certain trisomies including Down's syndrome. That's brilliant. Thank you. 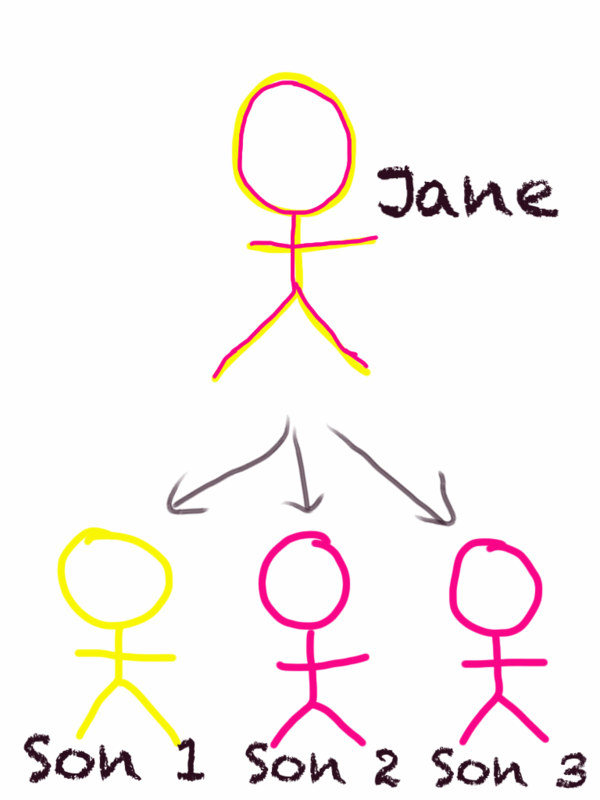 I was wondering how chimerism would affect the viability of kidney transplant from Jane's sons to Jane. How curious, very interesting, thank you. This is great. Really interesting and well written. Thanks for responding to the comments. Such an interesting article. I can't wait to read your next one!! This happened in a Kathy Reichs novel: Mortal Remains. Embryology is fascinating! Thanks for an excellent article. This is a post about oPortfolio - a project that Meducation and Podmedics are collaborating on. We have a Kickstarter project and would love your support! The Wrong Question Lots of people have been asking "will oPortfolio do XYZ?". As an open-source software developer I always find that a strange question, because there is very rarely a yes or no answer - the answer is pretty much always "it could do". Most people aren't used to having software made for them. Especially in the NHS, people have to live with often outdated systems that are enforced on them. Change involves committees and boards that they have no real access to. The open source world is very very different. You get to choose what features you want in the product - you simply need to ask. With oPortfolio, we are going to be guided by what doctors and students want. If a feature matters to lots of you, then we're going to work hard to get it in ASAP. If only one person wants it, then it's less likely to get priortised. Right now, the quickest way to get your voice heard is to support us on Kickstarter. When we reach our total, we'll be emailing everyone who's supported us to ask what the most important features are. If you want to make sure you're heard - that's the best way to do it. The Right Question In case you're wondering, a better question is "How can I help you get XYZ into oPortfolio?". Open Source is about people collaborating to make something better, expecting nothing in return. We'll write the code, but your input, support and guidance is what will make this happen. Will oPortfolio do XYZ? Quite simply, yes it probably will, if you drum up some support for the idea and come and talk to us about it. Please support us today. Thank you. What Does The Perfect Online Exam Revision Site Look Like? Over 20% of UK medical students have used our exam room to revise. It's one of the most heavily utilised parts of Meducation and one of the most popular. But it's been a while since we did any work on it, something that we're about to rectify! We want to give you the opportunity to tell us how to make it even better! What's There Already? To recap where we're at currently. We have: Thousands of questions (a mixture of SBAs, MCQs and EMQs) split into over 30 categories. You can take exams of between 10 and 50 questions. You can time your exam if you're Premium You can compare your results in each question to the rest of the community and, if you're Premium, your medical school or year. You can comment on questions and vote them up or down. What Do You Want Improving? So this is your opportunity. What does a perfect online exam revision section look like? What features would you love? What annoys you? We want make the perfect section to help you practice for your exams, so please tell us what you want included. Post a comment below with your ideas on. If you agree with what someone else has said, please vote their comment up. Those that get voted up lots, we'll definitely try and implement! Who is oPortfolio aimed at? This is a post about oPortfolio - a project that Meducation and Podmedics are collaborating on. We have a Kickstarter project and would love your support! Students? Junior Doctors? Senior Doctors? Over the last two days we've been asked by lots of people who oPortfolio is for. Some people want it for students, others to replace junior doctor systems, and some for revalidation purposes. The simple answer is that it's for everyone going through their medical careers from student to consultant and on to retirement. Challenges There are two challenges to building a system that's relevant for such a wide variety of people. The first is to make something that has all the features that are needed for all the people. We are strong believers in self-directed learning and want that to be at the core of oPortfolio. We want people to be able to build their own personal portfolios, keeping a log of everything they want to - their own personal space for reflection and learning. oPortfolio should be something that you find useful at all stages, and that's crucial to our vision. The second challenge is working with existing ePortfolio systems, and to have functionality that deaneries and Colleges need to adopt our platform if they want to. Making a system that is incompatible with existing systems, or that involves doctors still having to use other horrible software defies the whole point of what we're doing. If a user's oPortfolio has to be manually copied & pasted into another system, everyone loses out. This, therefore, also has to be a large consideration as we move forwards. At all times, we will have to balance these two challenges up against each other. Conclusion oPortfolio is for everyone. It certainly won't have all the features that everyone needs from day one, but our aim is to build a solid base everyone can use, and then expand it from there. With regards to who we give our initial focus to, it will be the people who support us on Kickstarter. They are showing genuine support for what we're doing, and therefore deserve to be prioritised. That only seems fair. Please support us today. Thank you.